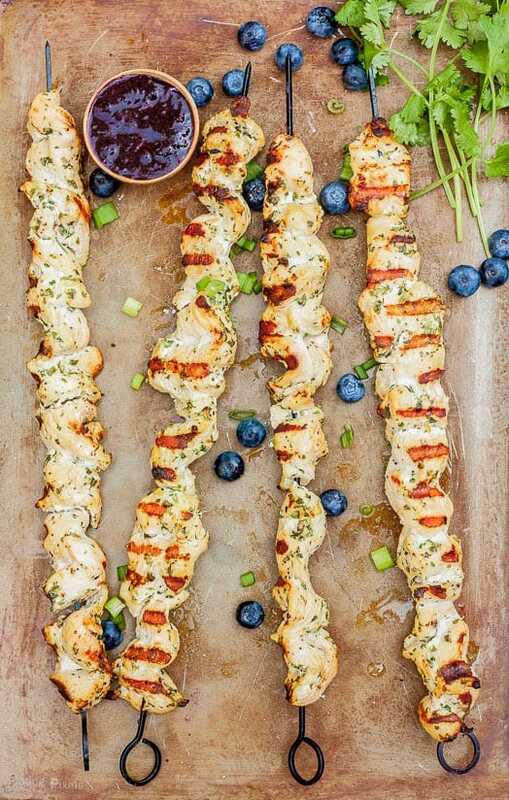 Within this post you’ll learn how to make an easy marinade for chicken Orange Herb Chicken Kabobs, and an accompanying blueberry balsamic sauce. These chicken kabobs are easy to prep ahead of time, and can be grilled in minutes once you reach the party. This was inspired by the ease of Cayman Jack Margarita. It’s pre-made and can be enjoyed straight out of the bottle. That’s less time prepping and more time on important things, like socializing with friends or family. The chicken kabobs are marinated in fresh herbs and orange, giving it subtle, but rich flavor undertones. Fresh basil, cilantro, garlic, orange juice, and zest create a crisp and refreshing flavor. 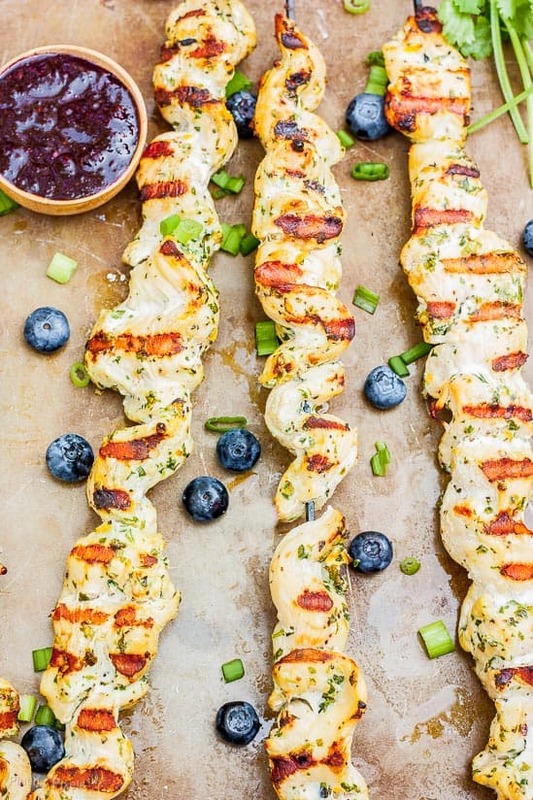 The kabobs are wonderful as is, but even better with the Blueberry Balsamic Sauce. This isn’t your everyday sauce. You may have heard of mixing fresh blueberries and balsamic vinegar; but lets take it further and add in agave syrup, minced green onions and pickled jalapeños. This is what sets it over the edge, sweet and tangy with just a bit of spice. Flavor profiles: Bold and meaty, paired with slightly sweet and tangy. Texture: Moist, tender chicken, with thick blueberry balsamic glaze. Dietary Options/Substitutions: These are gluten-free. Could substitute fish or shrimp. Note: Prep time does not include marinating. Easy gluten free chicken kabobs in fresh herb marinade. Top with rich blueberry balsamic sauce. Add all marinade ingredients (except chicken) into a food processor. Pulse until minced and well combined, stirring and scraping sides as needed. Place chicken strips and marinade in a large ziplock bag or bowl. Mix to evenly coat. Refrigerate for at least an hour and up to four. You can move onto the sauce while marinading. Preheat grill to medium high. Tightly thread chicken accordion style onto skewers (leave marinade coating on chicken). Lightly coat grill with oil to prevent sticking. Grill 12–15 minutes until cooked through and grill marks appear; rotating midway. 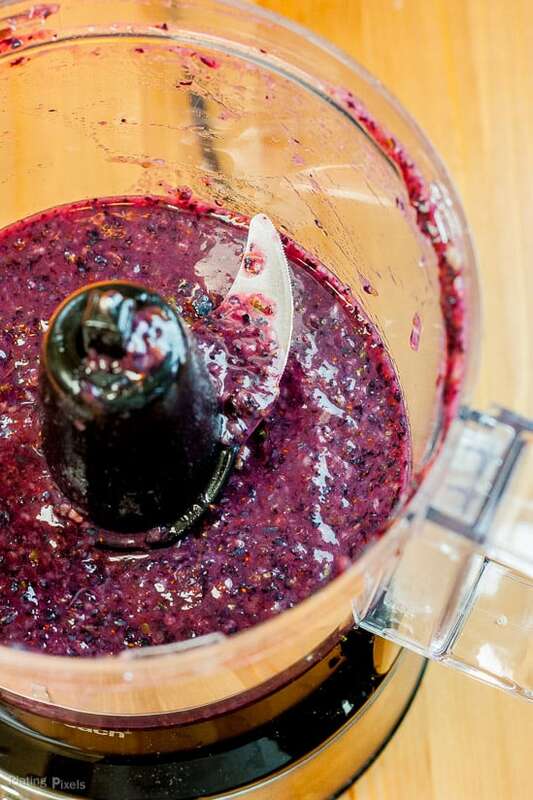 Place ½-cup blueberries, jalapeños and green onion into clean food processor. Pulse for roughly 30 seconds to blend into small chunks. Set aside. In a small pan, heat reaming ½-cup blueberries, balsamic vinegar and agave syrup over medium heat until just boiling. Reduce heat to low and simmer for 10 minutes. Smash blueberries in pan with a masher or flat spoon. Stir in cornstarch mix. Increase heat to medium, then boil 2–3 minutes to thicken up, stirring often. Combine with minced blueberry mixture. Allow to cool. Spoon chilled sauce over grilled chicken kabobs and serve with Cayman Jack Margarita. What’s your favorite food to grill as kabobs? Would you like to pair this with margarita on a hot summer day?